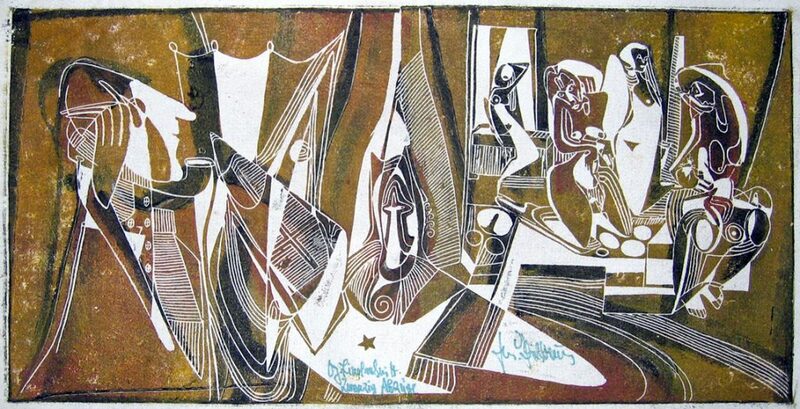 „Large abstraction“, woodcut on felt, 1955. Helmut Gaissbauer was born in 1927 in Bruck an der Mur, Austria. He studied at the Sculptor school in Villach as student of Josef Dobner. After WWII, he worked as freelance artist in Unterberg bei Bodensdorf am Ossiacher See, in Hamburg and in Vienna. He died in 1992 in Villach.